for me when I launched my 1st Coaching Skills ‘open programme’ recently. At the end of the session all 9 participants could describe what coaching is, its benefits and where it fits with the day job. Even more importantly, they were able to ‘coach’ and left ready and raring to use this important skill with their teams and colleagues! 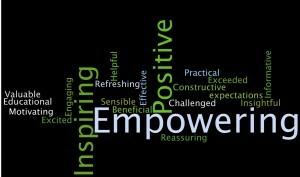 This Wordle chart captures how participants felt about the session. ‘Empowering ’, ‘Positive’ and ‘Inspiring’ appeared repeatedly. As a qualified and experienced coach, knowing the great benefits that managers can reap through coaching, it was incredibly rewarding to see this new group ‘get it’ and feel inspired to use their new found skills. My ‘open programme’ makes learning coaching skills far more accessible, offering individuals and smaller organisations an affordable way to invest in their management development. Having attendees from a variety of organisations brings an interesting dimension to the learning, as participants get to share best practice and network across other industries.